Audrea enjoys speaking life into the lives of women, encouraging them to realize that they are valuable. Dr. Audrea's desire is to see God's people become enlightened and equipped in order to live the victorious life that God intended for them to live. She emphasizes the practical application of God's Word to life's everyday situations. A focal point of her ministry involves encouraging individuals to realize their significance in the eyes of God, allowing them to freely receive the provisions He has already made for them. Her desire is to be used by God to cause spiritual insight to manifest through the power of the revealed Word and the anointing and empowerment of the Holy Spirit. 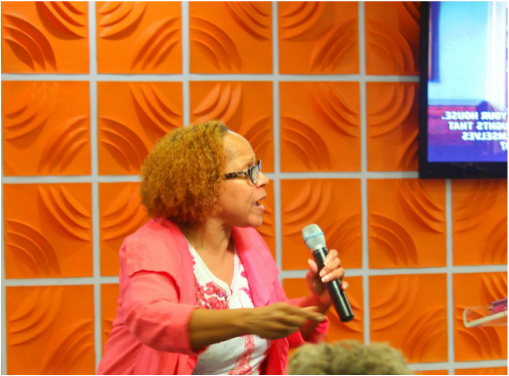 Dr. Audrea uses a down to earth delivery when addressing issues that hit home and she directs individuals to the answers the Word of God has for them. Her message of unconditional love and hope penetrates the barriers and walls that have been built as protection from more hurt and disappointment that results from life's experiences. Her own transparency allows them to see that she is putting into practice the same principles in her life that she is endeavoring to have them apply in theirs. She is a 2006 graduate of Word of Faith Bible Training Center - Southeast and is a Certified Biblical Counselor. Additionally, she holds a B.S. in Criminology from Florida State University and an M.S. in Community Counseling from Georgia State University. She completed courses via the School of Professional Life Coaching of Light University Online to become a Certified Christian Life Coach. She is graduate of Faith Christian University where she and her husband received doctoral degrees in Bible and Theology. Dr. Audrea is also the co-founder, along with her husband, of The Directed Path - Counselors and Consultants providing biblical answers for life's everyday challenges through a variety of services, and The Psalm 139 Coaching Experience offering a variety of coaching services. They are both members of the American Association of Christian Counselors and the International Christian Coaching Association. Dr. Audrea enjoys speaking to groups, both large and small, and participating in workshops and conferences. She believes that her mission is to challenge individuals to live up to their fullest potential and to enjoy the journey of life and to maneuver their way through the many experiences with joy in spite of the circumstances. She has contributed to several publications over the years offering insight, counsel, and inspiration; these contributions were in the forms of offering guidance in Christian counseling columns, contributing as a writer of daily devotionals for her local church, and sharing inspirational stories for a newsletter sent to women on a weekly basis. She is currently working on projects that will be published in the near future.